Foreign Minister Dr AK Abdul Momen on Sunday said Bangladesh had achieved its recognition as a sovereign country across the world in a first paced after its bloody birth in 1971 due to charismatic leadership of Father of the Nation Bangabandhu Sheikh Mujibur Rahman. “Bangabandhu’s charismatic and farsighted leadership is the reason to get the recognition from the United Nations and other countries within short span of our independence in 1971,” he said while speaking at a seminar in the capital. 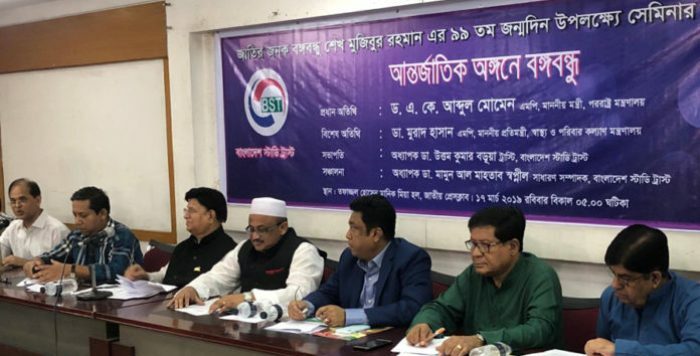 Bangladesh Study Trust organized the seminar titled “Bangabandhu in International Arena” at Jatiya Press Club in the capital marking the 100th birthday of Bangabandhu. The foreign minister said Bangabandhu had outlined the independent Bangladesh foreign policy as “friendship to all, malice to none’ after the independence. “We are still following Bangabandhu’s foreign policy, and the successes we so far achieved in the international arena those are realized for this foreign policy,” he added. Momen said Bangabandhu’s comprehensive understanding about the country’s people helped Bangladesh to achieve many successes in home and abroad. “Our Prime Minister Sheikh Hasina is advancing the country towards the path that was showed by her father Bangabandhu,” he said. State minister for health and family welfare Dr Murad Hasan spoke as the special guest while former ambassador AKM Atiqur Rahman presented the keynote paper. Bangladesh Study Trust President Professor Dr Uttam Kumar Barua presided over the discussion while general secretary Dr Mamun Al Mahtab Shwapnil moderated. In his keynote paper ambassador Rahman said most of the countries except Saudi Arab, Sudan, Oman and China around the world gave recognition of the independence of newly born Bangladesh before assassination of Bangabandhu. “This is a huge success for the foreign policy of any newly born country like Bangladesh,” he added. Rahman said the reason behind this success was Bangabandhu’s dynamic and farsighted leadership as well as his personal warm relations with the world leaders. During January 1972 to August 1975, more than 100 visits of foreign delegations including 50 led by heads of states or government were held in Bangladesh within this short period of three and half years. Bangladesh had signed more than 70 agreements or memorandum of understanding with different countries across the world during the period and received billions of dollars financial assistance from different countries and aid agencies to rebuild the war hit country, said Rahman.